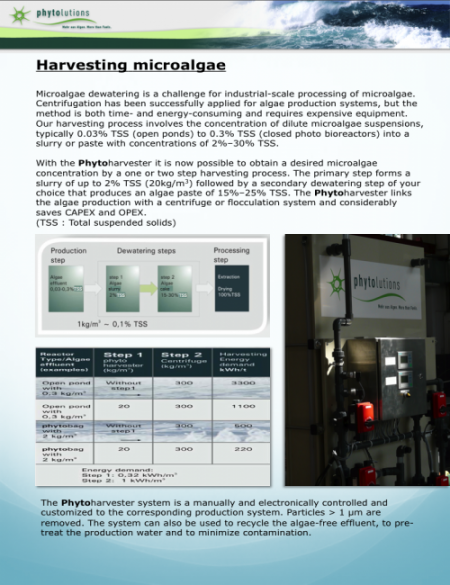 Microalgae dewatering is a challenge for industrial-scale processing of microalgae. There is no superior method of the concentration process and although centrifugation has been successfully applied for algae production systems, but it is both time- and energy-consuming and requires expensive equipment. The concentration process is a major obstruction to industrial-scale processing of microalgae. With our phytoharvester(patent pending) it is now possible to obtain a desired microalgae concentration by a one or two step harvesting process. The primary phytoharvester step forms a slurry of up to 2% TSS (20kg/m3) followed by a secondary dewatering step of your choice that produces an algae paste of 15%–25% TSS. The phytoharvester can be adjusted to any separator or centrifuge which work under different centrifugation conditions.